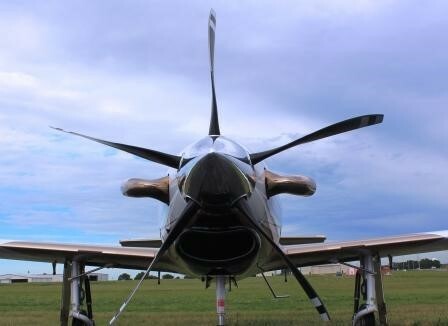 Piqua, Ohio, July 18, 2016 – Evolution Aircraft has completed extensive performance and noise testing confirming the performance improvements of the new Hartzell five-blade composite swept tip constant speed prop for the Turbine Evolution. The new technology 82.5-inch diameter five-blade propeller is available as an optional performance upgrade in place of the four-blade Hartzell aluminum propeller that is standard equipment on the Turbine Evolution. In addition to new aircraft kits, the new carbon fiber propeller is available as an upgrade for the 65 Turbine Evolutions flying today. Even though the new propeller has one more blade, it is 3.5 pounds lighter than the standard propeller including spinner and de-ice. In flight tests comparing the four-blade aluminum prop with Hartzell’s new five-blade structural composite propeller, Elite Pilot Services documented a three knot increase in cruise speed and a 144 feet per minute increase in climb rate in theTurbine Evolution. “This gives pilots and owners of the Turbine Evolution a new propeller option to get higher faster and fly faster at altitude,” said Evolution Aircraft CEO Bob Wolstenholme. The new five-blade Hartzell carbon fiber prop will be displayed on a Turbine Evolution aircraft during EAA AirVenture, held July 25-31 on Oshkosh’s Wittman Regional Airport at the Evolution Aircraft Exhibit Booth 275-276 in the Main Aircraft Display area. Hartzell Propeller will also exhibit its other composite technology props, including a swept-tip Trailblazer prop at its Exhibit Booth 296-297. With a 300 Knot speed and a 28,000 foot max operating altitude, the four place pressurized Evolution Aircraft is the epitome of the owner-built high performance aircraft concept that was pioneered by Lance Neibauer in 1986. The Evolution Aircraft history of high performance, cutting edge construction techniques, and the adoption of the latest in avionics technology was never more apparent than in this exciting aircraft. Evolution Aircraft’s core competency lies in carbon composite construction and aerodynamic efficiency, and when this is coupled with the power and reliability of the Pratt & Whitney PT-6 turboprop engine, what emerges is an aircraft that is simply unmatched in the certified world. But certification has its place, of course, and Evolution Aircraft recognizes that. Therefore, whenever possible Evolution Aircraft has observed and incorporated the engineering principles and requirements of certification to ensure a safe and airworthy aircraft for the owner-builder. Evolution Aircraft uses the FAA’s Part 23, Utility Category as guidance in airframe design criteria for strength, redundancy, handling, safety and ergonomics whenever possible.